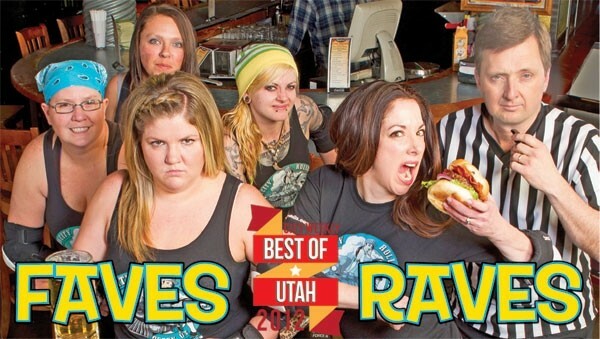 The Copper Onion has cemented itself as one of downtown Salt Lake City’s favorite dining gems, winning BOUs for the past three years. Among its tasty and creative small plates served amid a bustling atmosphere are some amazing appetizers. “Their pork deli appetizer, which I like to call a salad” is the reason Tony Caputo, right, of Tony Caputo’s Market & Deli (multiple BOU winner for Best Deli and Best Sandwich) returns time and again. When it comes to hotels in Salt Lake City, The Grand America does it well, known for astounding hospitality, superior brunch at its Garden Cafe and afternoon tea. “If I’m not cooking for guests at home, I go to The Grand America—their dinner is the best,” says Walter Nassi, owner of Cucina Toscana (BOU winner for Best Italian in 2008 and 2009) of this truly grand hotel. “I just love the energy of the people and food at Kathmandu, House of Tibet and Cafe Shambhala,” says Ian Brandt, Salt Lake’s vegetarian restaurant guru (winner of multiple bests for his Sage’s Café, Vertical Diner and Cali’s Natural Foods). "These restaurants make you feel so loved in their spaces and the food is great." The same folks who brought you the popular Copper Onion recently opened 2012’s Best New SLC Restaurant—Plum Alley. The Asian eatery is earning praise from many, including Takashi Gobi, right, owner of Takashi, a multiple BOU winner for Best Japanese and Best Sushi. When Takashi’s not fly-fishing, he says he enjoys Plum Alley’s ramen noodle soup. "Their broth is homemade,” he says.